This recipe is an excellent source of protein, niacin, vitamin B6, vitamin B12, iron, selenium and zinc; and a good source of fiber. 1. 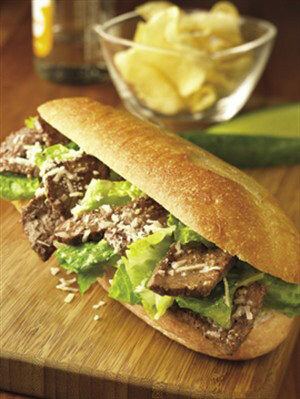 Cut beef steak lengthwise in half, then crosswise into 1/8 to 1/4-inch thick strips. Reserve 2 tablespoons dressing. Pour remaining dressing in medium bowl. Add beef; toss to coat. Cover and marinate in refrigerator 30 minutes to 2 hours. 2. Remove beef from marinade; discard marinade. Heat large nonstick skillet over medium-high heat until hot. Add 1/2 of beef; stir-fry 1 to 2 minutes or until outside surface of beef is no longer pink. (Do not overcook.) Remove from skillet; keep warm. Repeat with remaining beef. 3. Toss lettuce with reserved dressing and 2 tablespoons cheese in medium bowl. Divide evenly over bottom of each roll. Top with beef; sprinkle with remaining cheese. Close sandwiches.